Kindness, so powerful yet so underused. Kindness is defined as the quality of being friendly, generous, and considerate. How would you describe kindness in your own words? Friendly, generous, warm-hearted, soft spoken; these are all words I would associate with being kind. Now are those words you would also associate with your home? Kindness is honestly one of the greatest gifts you can give someone. As Christians, kindness is something He expects from us. It allows Christ's love to shine through us. He doesn't want us to be unkind, we are to be different. 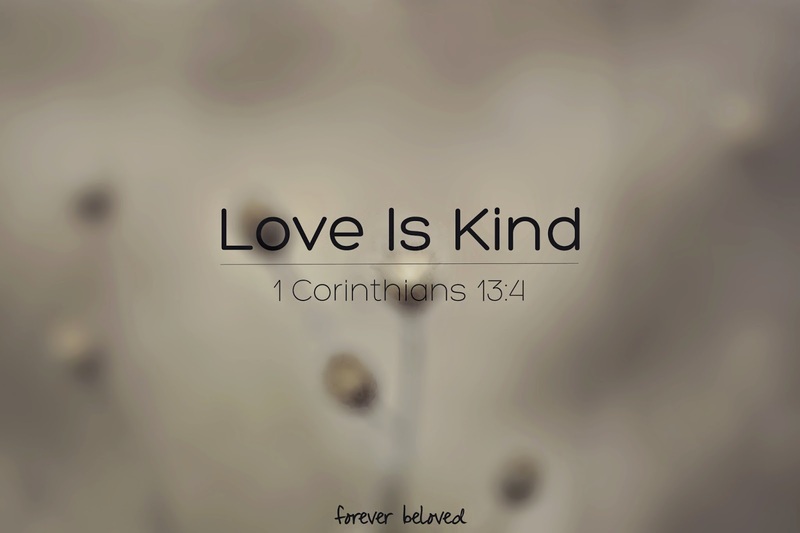 I think kindness could be boiled down to 3 little words...love in action. When you are operating from a true heart of kindness, you will be extra careful how you treat your spouse. You would never want to be unnecessarily harsh or hurt their feelings. We need to be sensitive to their feelings and tender with our words. Even if you need to say hard things, we need to remember to speak the truth in love. I think if we asked our husbands what they wanted, they would all agree on one thing...a girlfriend. Now, before you fly off the handle I certainly don't mean another woman entering your relationship. What I mean is, think back to those first months of dating. When the only label you had was "girlfriend". You complimented him, asked him if he needed anything and pursued him. You wanted to make sure he always felt appreciated. You wanted to let him know, through your actions, how much he meant to you. Then you got married. And had babies. Now you are sleep deprived, the bills seem never ending, the house needs cleaned, dishes need done and does. the. laundry. never. end.? The last thing on your mind is being your husband’s girlfriend. But, why is that? Why is it that it's soooo easy for us to give our all to everyone around us and only give our husbands the left-overs? I want to be a wife who never stops pursuing my husband’s heart. I want to be a wife who makes sure, day in and day out that my husband knows he is appreciated, wanted and respected. I want to be a wife who has a smokin' hot marriage. How can i get that? Not simply kindness, but kindness without conditions. What does that mean? Smiling at him when I sure don't feel like it. Serving him and not expecting it in return. Giving him the best of me, not the leftovers. Keeping my mouth shut and biting my tongue. Remaining neutral when he needs a sounding board. I'm sure you can think of many other ways. We need to remember that kindness isn't about us. In fact, kindness isn't kindness if you're expecting a reward for it. A thriving marriage requires kindness. It requires putting your own feelings, tiredness, sassy-mouth and selfishness aside. It means intentionally showing thoughtfulness, compassion and sympathy to your husband. These are the moments that will build more trust in your marriage. The moments you can use to grow your love. As parents, kindness is so so super important. Kindness is basically love in action. And one of the greatest expressions of genuine love is showing kindness to our children. It’s easy to think that because we are the parents, because we are so much more mature and have sacrificed so much for them, we can treat them however we want. But love reminds us that our sacrifices certainly don't give us a license to be uncaring or harsh. Your littles are more sensitive to you than anyone else on earth. When you treat them unkindly, resist them or ignore them they will likely struggle inside and not respond well to you. But when you create an environment of tender love and kindness, they become more open to sharing their heart with you and listening to the words you say and the lessons you share. Love leads you to look for opportunities to show kindness to your littles. This doesn't mean doing everything for them. It doesn't mean buying them everything under the sun. It just means loving them, isn't that easy? When they talk, listen. When they cry, hug them. When they laugh, laugh with them. When they have a bad day, cook them their fav meal. When they make a mistake, love them. When you're shopping, buy them a treat. Let them pick a show to watch, a game to play or a song to listen to. Kindness is also finding a balance between loving them well and teaching them to love others. Part of them becoming an effective adult is learning as a child to have a servants heart (aka...kindness in action). That’s a heart they should see reflected in us as parents. If they watch us being kind to others, they will reflect that as adults. Acts of kindness don't have to be huge, expensive, flashy ordeals. smile at someone, hold the door for them, give them the 30 cents they are searching for to pay for their McDonald's order, help them carry their bags to the car, hug them when you can see they need one, take time to talk to them and pray with them and for them. We need to learn to be gentle, sensitive and tenderhearted. When we start being tenderhearted, it's easy to be kind. Having a heart that is easily touched and sensitive doesn't mean your weak, although that's what the world would say. If we are sensitive to those around us, we start seeing their needs instead of our own. Have a loving, tenderhearted, compassionate attitude and let it shine for everyone to see. You can change lives with your actions. You can change lives by your words. You can change lives with your kindness. You can change lives by allowing Christ's love to shine through you. You might be the one voice in their life at the moment that they need to hear. Your encouragement might be the one thing that keeps them going. Maybe you are the one who is to help them see Jesus. Your actions, words, prayers and love matter. Your kindness matters. In your home and outside of it. It matters to those who receive it and it matters to Him. You might not be able to help everyone, but you can help someone.